Brightness controller is a small tool that allows the user to adjust the backlight brightness of Apple Displays on a Windows PC. I only own a 27" Cinema Display and have to rely on the users to do the testing for other displays. Brightness controller has been tested on Windows 7 and 8 in both 32 and 64bit. But it should also work fine on Windows Vista. It also supports multiple displays at once. I will try to update it to support additional models but i will need help from other users who have different screen types. If you wan't to contact me about feature requests or wan't to help adding aditional display models then contact me on Google+ or in this [H]ard|Forum thread or create a issue in the issue tracker. If you like the tool please donate for further development. - Fixed bug where the main windows was opened behind other open windows. - Added support for 23" Cinema Display HD with acrylic frame. - Fixed startup crash with 24" Cinema Display. - Improved numeric inputs so letters can't be pasted. - Layout adjustments, spelling fixes, better error messages. - Added profiles that allow the user to set the brightness to a specfied values. - Fixed detection of 27" Thunderbolt Display. - Added support for 24" Cinama Display. - Added support for 27" Thunderbolt Display. - Added tooltip when moving the slider. - Collect data about HID devices to add support for more screens. - Removed the last references to windows forms. - Improved Update checking and added fallback sites. - Lots of changes behind the scenes like improved threading and preperations for future multi monitor support. - Fixed bug where disabled Hotkeys could not be enabled. - USB changes to allow the program to be compiled for both x86 and x64. - Settings are now upgraded from previous versions. - Options window now opens centered on main window. - No longer installs in "Program Files (x86)" on x64 systems. - Added Supports for fast user switching. - Fixed a crash bug that occured when opening about box from system tray. 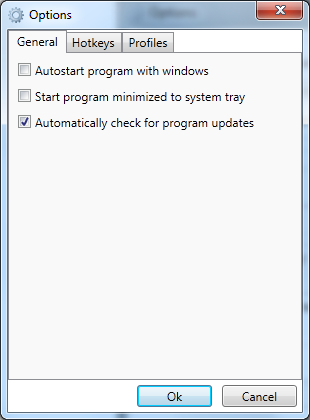 - Installer now detects if program is running. - Hotkeys can be individually enabled or disabled. - New Hotkey for turning off the display. - Improved asynchronous update checking. - Added in app and web donation buttons. - Lots of code cleanup. 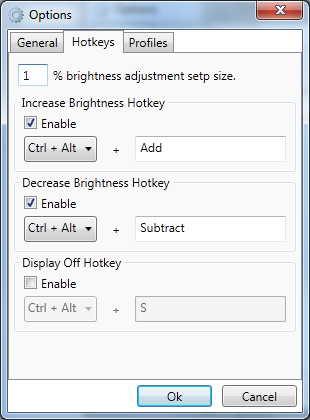 - Added options to configure Hotkeys. Thank you very much for your product. Unfortunately, it did not work for me. I am running win7-64 + ACD 27 + NVIDIA GTX 670. It says "Unable to detect any Apple Display USB HID Devices". Did you remember to connect the usb cable? Hello. I connected Apple Thunderbolt Display 27" to my PC. Please make sure the USB cable is connected." Are you using the apple control panel or any other software that might interfer? Has windows detected the other HID devices in the monitor like the built in webcam? It might also be a new hardware revision of the thunderbolt display. Try "Help -> Gather HID Information" in Brightness Controller. If it finds any information you can create a new issue in the Brightness controller issue tracker. I have not install any software. Display is has sound, but no camera and brightness is very low. What is apple control panel? It is Bootcamp? I deleted your comment by accident. Sorry. In response to your question about multi monitor support. It is already in the issue tracker and the code has been written. But i despise releasing untested features so multi monitor support has been disabled for now. But if you are willing to test it and give me some feedback i will release a beta with support for multiple monitors. Where can i find the beat so i can test it? System.Runtime.InteropServices.MarshalDirectiveException: Cannot marshal 'parameter #3': Invalid managed/unmanaged type combination (Int32/UInt32 must be paired with I4, U4, or Error). Jeg har også prøvet at bruge programmet selvom jeg har deaktiveret en af skærmene, og det ser også ud til at virke fint, også når skærmen aktiveres igen. "Display off" genvejen har jeg fikset nu og det kommer med i næste release. Men jeg ved ikke helt med fluebenet til at låse dem sammen. Det skal jeg lige tænke lidt over. Det vil give lidt problemer med auto brightness... Hvis der kommer sollys på den ene skærm og den så begynder at skrue på skal den anden skærm så følge med selv om den står i skygge? Det er umiddelbart den eneste løsning jeg kan se hvis jeg skal låse dem sammen. Screen off shortcut should be fixed. I just picked up a 2nd of the 27" led ones (display port). Will it actually work? I've got an open display port on my sli card. I am planning on adding another card and 3rd monitor in a couple of months. I'm assuming I can only have one USB dongle plugged in at a time, so I will have to switch them to set the brightness on monitor 2 temporarily? Any other caveats? If you use the newest beta linked above you can connect both displays at the same time and control them independently. Brightness controller will show a slider for each display. So in that case I should hook up both USB dongles? Will it matter that it is plugged into video card #2 in an SLI setup? Will this eventually be able to support 3 monitors for things like eyefinity or nvidia 3d vision? Evidentially, being the SLI noob that I am I didn't realize only the first card in an SLI chain can actually output video. So, that means I am stuck with those Atlona DVI to Displayport converters for any additional ACDs on my desktop. Brightness controller communicates with the monitor via the USB cable not the Display Port cable. Converters are not an issue. It worked! When I get paid next I will donate. Hey offhand does anyone know if these monitors support 2d eyefinity/surround gaming when one monitor is using a dp-minidp connector and 2 are using atlona dp400 type devices. I'm assuming the brightness controller app will work with 3 monitors. Another question, is it possible to sleep one monitor while keeping another active other than unplugging it? Watching movies with both displays active is somewhat distracting. I don't see any way to putting only one monitor to sleep with the windows API's i currently use. But I will check some more to see if there is any way of doing that. Any chance one of you multi display users can take a screenshot of the main windows for me, so i can put it on the page? I just remembered that you can press Win+P (in win7/8 at least) to get nice multi monitor shortcut options directly in windows. If you can chose single monitor windows should kill the signal to your secondary monitor and it should turn off. I will try to do some more for dual monitor setups in the next release(a slightly better layout and brightness locking). actually strike that one, too much personal info if you can just delete that last post I'll send another one. Damn our digitally integrated lives. Please make support for old ACD 20"
Tried three different versions of you app - says no ACD found. If you can add the information i need i will add support for your display. Noticed that my brightnesscontroller takes too long to start after reboot - about 20 sec after all loaded. I get the following error: "Unable to open Cinema Display USB HID Device. Make sure any other program using the device are closed. I am using Windows 8 x64 on my 13" RMBP. I am also using a thunderbolt display, not a cinema display. Well.. Make sure the apple control panel is not open. If that does not solve the problem then try selecting "Help -> Gather HID information" and post the results here. That will allow me to add your display if it is a new hardware revesion/variation of the thunderbolt display. Yes! after all that time, I needed to know that to understand why sometimes it would work or not. I didn't think of a conflict with the apple own setting panel. Hello! I have a Win7 workstation with 2 24" LED Cinema Displays. Upon connecting the USB cables some devices are found by windows and drivers get automatically installed. Unfortunately the brightness program does not find the Apple displays, and the "Gather HID information" option gives the same results as on a PC with no Apple screens - there is nothing listed. Are some special drivers needed? What should be listed in Windows Device Manager so that your app can pick up the screens? Hello! I found out that the previous workstation user installed Bootcamp, and it seems that it was taking over the display connection. After uninstalling Bootcamp, your app worked like a charm ;). Ok good to know that you got it working. The access to the HID device is exclusive and if another program has an open connection to the device i can't connect to it. I will look into the problem in the future and see if i can add a better error message if the device is present but in use. But i need to make some changes to the HID library that i am using to support that. 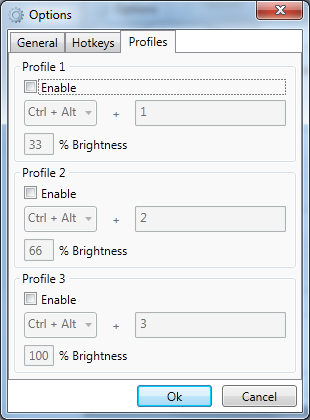 thank you very much, best program to control brightness for windows. what benefits to use .net 4.5 in last release ? I have changed some code with the upgrade that should allow for better performance but nothing most users would notice. The reason i upgraded is that this is a hobby project. I use my hobby projects to test and learn about new framework features (and related pitfalls) before i need to use them at work :-). Mine said UNable to open Cinema Display USB HID Device as well. I'm using MacBook Pro from 2009, windows 7 enterprise 64 bit, and a new 27 inch cinema display. Here is my HID information. If you are using a mac book pro you probably installed the bootcamp drivers. In that case the bootcamp drivers block access to the cinema display and you need to use the apple control panel to adjust brightness. Brightness controller was designed to avoid installing bootcamp drivers on a normal none Apple PC. If you need me to add a new screen type please create an issue in the issue tracker and post the HID information there. Thank you for this product. I was actually not looking for a brightness control. My USB ports on my 23" HD Cinema are not working.... but I found your site and would LOVE to have bright control in my Win 7, 64bit environment. 1)I downloaded and when I tried to run it asked what program I wanted to use to open the file. Obviously not an exe. What is wrong? 2) Will this program bring my USB ports back to life? When you download it that should give you an executable installer named "Brightness Controller 1.4.4 Setup.exe". And yes that is a .exe file. If you can't download the file correctly please let me know and i will upload it to another location. As to your second question it is very unlikely that my program will affect the usb ports on the monitor. System.Windows.Markup.XamlParseException: The invocation of the constructor on type 'BrightnessController.MainWindow' that matches the specified binding constraints threw an exception. ---> System.UnauthorizedAccessException: Attempted to perform an unauthorized operation. I can't reproduce the bug on my system. But i will upload a debug build that you can test in a few days. It will have the same bug but the exceptions will have line numbers so i can narrow down where the problem is originating. Please follow and respond to this issue regarding your problem with startup crashes. Great program! I was looking for this for a long time and I have finally found it. Unfortunately, when I try to run the program it does not recognize my display showing "unable to detect apple display" i have made sure also that it is connected to the usb port as instructed. If it help, I'm using Windows 8 64 bit. Please help! Do you have any apple bootcamp drivers or the apple control running while trying to use brightness controller? If not then please go to "help -> gather hid information" and check if it detects anything. I have created an issue in the issue tracker. You can post the result from the "help -> gather hid information" function there. Btw, most of your files to download need to be renamed from Brightness to "Brightness.exe" in order for my Win7 64-bit to recognize how to open them. I think the 1.01 was the latest one that showed up as an .exe file right away, the newer versions needed renaming. Auto brightness is only supported on some displays like the 27" cinema display and the 27" thunderbolt display. They have ambient light sensors and turn the brightness up and down without my tool doing anything. All i tell the monitor to do is turn auto brightness on and off. About presets... Brightness controller currently has 3 configurable presets with configurable shortcut keys in the options menu. Do you need more than that? I tried it with a 24 cinema display and works wonders. Also, i have a dual screen it does changes the brightness on both screen simultaneously which is pretty awesome. Something i would like to be added is the power function for individual screens. Sometimes i just need one monitor turned on but i cant just have one unless i unplug it from the pc (which is my quick fix so far) Would that be possible? I have found no options for turning off a display in the USB device so i have no real way of controlling what displays are turned off. Brightness controller uses built in windows power saving API's and just tells windows to turn off the displays. So even if i could target a specific display windows would turn it back on at the first user interaction. However. As you mentioned the display will turn off if it has no signal from the PC. So my best advice is to unplug it :-( or maybe take a long look at what options windows or your gfx driver has? If you press "Win+p" you should get a quick option to change your multi monitor setup in windows. If you set it to only output on one monitor it might turn off the second one. I can look into creating multi monitor profiles and switching between them but that is really outside the scope for this tool and i think there are a lot of other tools for this. Can you report back if setting windows to only use one monitor turns off the second cinema display? Hi, I installed Brightness Controller in my PC with Windows 7 and it worked fine for a couple of days but now it does not work and is giving me a message like this : "Unable to open Cinema display USB HID device. Please make sure any other program using the device are closed." The usb cable is regularly connected and I may hear the sound of my PC. I cannot install the display isight since no drivers are available. Please help ... Thanks and bye till later, Renato. You are probably using a new/unsupported hardware revision of the display. Open brightness controller and then select "Help -> Gather HID Information" in Brightness Controller. I copied the HID and also have written it but I don't see it in my reply. Please did you receive it? Tahnks for your kind help. I only see blank replys. Can you post a new bug report here in stead. but I see that was sent by Anonymous and it is n. 29. The thunderbolt cable has excatly the same connector at the old display port... but it is NOT compatible in the way you need. If you have a PC with a thunderbolt port you can attach a display port display or a thunderbolt display. I would recommend that you buy the "old" 27" cinema display. It uses a display port cable and a usb cable for the sound/webcam and so on. I've been trying to use brightness controller with my PC, but so far, I get a red message saying "unable to detect any Apple display". On my windows control panel / System, I get a dysfunctional USB input device (yellow decoration) with the following error: "The passed ACL did not contain the minimum required information". Windows 8, up to date. Cinema display, the old 20 inches variety. Firewire cable is not connected, as I do not have such I/O port in my new PC. Any idea / suggestion / further question ? Upon exiting the Windows 7 lockscreen I see this error. Can this be fixed? hello, I am running on windows xp, have a 2 27 inch displays and can't install .Net 4.5 as it's not supported by xp. IS there a way non .Net required version that supports 2 displays ? Hi, I'm using it with an apple 23" screen with brushed steel round the sides. The software isn't able to detect the display. Is there anything I can do to fix that? I'm on win 7 professional service pack 1. When I look in the control panel there is no information about the screen. your brightness app is really awesome and just what I was looking for - Thank you! I have a question - I would love to run target display mode on my iMac under bootcamp - there is no possibility nowdays. Do you think you can help me with this somehow? Or write a bit of a code for this? If so you already have a sponsor for development because I really need that. Thank you so much! I have a question. I have 27" thunderbolt cinema display and I bought Displayport (Male) -> Minidisplay port (Female) adapter and pluged the cable from the display to minidisplay (female) end of the converter. But my windows pc does not recognize a new device. Hi Jens, thanks for at great program. I have a little problem each time I start my ThinkCentre Windows 8.1 pc that is connnected to a 27" Apple Thunderbolt display, the display light is dimmed after 30 seconds after Windows has started. I then have to start your program and which is set to start automatically with Windows and is already set to max brightness. When opening your program it is on the max brightness and all I have to do is is move the brightness controller back and forth and the screen brightness is ok againg. Do you know what causes Windows to dim the brightness each time I start Windows? I have installed all the right drivers and there is no errors in device manager. I use two monitors (Apple and Samsung) and i wonder that is it possible to turn off Apple without turning off Samsung? Any solution for my problem? Thanks, I never even knew such a software existed until now. Further, it has also fixed the audio issue on my Cinema Display 24" under win 8.1. Keep up the brilliant work! Hi, just downloaded and run it. The program shows the "Unable to detect any Apple Display", the USB is working (mouse is connected to the monitor). I guess that the problem is the Windows generic driver, but I cant find the proper one for my display, A1082 Apple Cinema HD. ¿can you help me, pls? Would you like to visit the download page now? Beta works (although the handle is almost hidden) - but works so I donated $3! Thanks!! Please UPDATE this for Windows 8.1 and 10. You built something VERY useful, you have a LOT of people replying on your program now. Please HELP us out! Would you like to visit the download page now?" Bump +1 on tweaking to support Windows 10 (either allow .NET 4.6 or remove the .NET requirement for install, as it comes with Windows 10 already). For now I'm using the older 1.00 version and it works (although buggy). I'll gladly donate for the update! Yes - please update so that it works with Windows 10. Will gladly donate as well for a working version. I have two Apple Cinema 24 LED displays hooked to two Windows 10 PC's and the sound will not work unless this program is installed. PLEASE HELP! bei HidLib.HidDevice.d__1.MoveNext() in c:\Users\Jens\Documents\brightnesscontroller\HidLib\HidDevice.cs:Zeile 199.
bei BrightnessController.App.Main() in c:\Users\Jens\Documents\brightnesscontroller\BrightnessController\App.xaml.cs:Zeile 52. You're a genius , thanks SO much for doing this ! I've worked So hard on my Cinema monitor problem , adapters, new video drivers, Apple boot camp drivers , everything, nothing worked... and just as I was about to quit I saw this via an Apple thread... Bottom line I'm sending you dollars ! You made my useless Cinema Display live again.. !! Nevermind... The newest beta in the download link fixed it for me. Thanks man! Donation coming! Hi everyone, i've downloaded version 1.00 and installed it. But when i start the Controller it starts shortly and close automaticly a few seconds later. So anybody knows a solution or have the same Problem? I was just gifted an apple 27" Cinema LED. I was very excited to find this utility; however, it unfortunately refuses to install. The application prompts to install .net framework 4.5. I'm running Windows 10 which comes with 4.6. If I try to install 4.5, the installer reports that I'm already running 4.5. OR... read the comments, see that someone tried the beta and it worked, download latest beta, install and....awesomeness happens! I am an IT consultant and we would like to offer you $500 USD if you can solve this bug: https://bitbucket.org/Gensplejs/brightnesscontroller/issues/41/doesnt-work-with-thunderbolt-displays-as. Please feel free to contact me directly. I sent you a hangouts invite. If you have any issues contacting me, please reply here and I'll keep watch. I just installed it on a win 7 VM and zipped up the exe and the ini configuration files. It works like a portable version. As mentioned severel times in the bugtracker. If you install the newest beta version it works fine with windows 10. In windows 10, brightness controller is telling me to install .net framework 4.5, but it's already installed. Then the brightness controller installer exits and will not install. Get the latest Beta version for windows 10 support. Thank you kindly for making this excellent free software, I have made a video about using it and installing it with windows 10. Please feel free to share it. Long days and pleasant nights to you. Latest beta, but it refuses to adjust the brightness. Displayport adapter into my geforce 1070gtx, windows 10 anniversary x64.. i got past the .net with the latest beta, and the screen shut off works (they come immediately back on). I am running an old 30" cinema display, a dell 30", and a 27" LED cinema display (which is the culprit). Adjusting brightness isn't adjusting the backlight, so I really want to get this working, as I am troubleshooting a randomly flickering backlight issue. Any help is appreciated, thanks! Habe nun ein Problem, es wird angezeigt dass ein kompatibles Display erkannt wurde, es jedoch von einem anderen Programm bereits genutzt wird. Wenn ich das USB Kabel rausziehe und wieder reinstecke funktioniert wieder alles bis ich neu boote. BETA link down :( "Oops, you've found a dead link"
Please fix the Beta Links. I made a mirror for my video if anyone needs it. Hi - I have a question regarding this software and my 23" HD Cinema (acrylic) display: will this application work for my display if I were to run the application within a Windows virtual machine? I'd like to correct the display issue on my Mac OSX side of things and then close the application/virtual machine afterwards and have the brightness settings remain. Is this possible through a virtual machine? It launches but then closes automatically. Hmmm. I just installed it on the latest version of win10 with creators update ant it works just fine. In my case, it had something to do with other applications hooking into the DirectX files, d3d9.dll to be precise. (Error was something along the lines of "d3d9.dll caused an access violation".) In my case, it was RivaTuner Statistics Server; exiting it (or setting its detection level to "none") allowed for Brightness Controller to start and work as expected. I am trying to get this going but it tells me to connect a USB cable? I am using a 27 thunderbolt... no usb cable on that. please help! Thank you. Hello, i have a 27'Thunderbolt display connected to a Assus ThundeboltEX II Dual, i need to plug a My PC USB to Display USB? If i plug another display, the song works good, if I take it off and restart, sound is off! Hi I've a ACD 30, can I use the Brightness controller? Running Windows 10. Going from the HP Envy's HDMI out-port to a Displaylink HDMI to DVI adapter and out to with an Apple Cinema 20 aluminum DVI cable. Running beta 1.5.7.30342. Receive: "Unable to detect any Apple display. Please make sure the USB cable is connected." What USB cable? Vielen Dank, Jens! I'm trying to install the latest beta onto Windows 10 (with all the latest updates), but I'm getting the error asking me to install the .NET 4.5 (I have a higher version). So the suggestions in this thread don't work :-( Any other tips? What did you do to fix this? I'm having the same issue on Win10 right now. Thanks! Solution: "Brightness Controller 1.5.7 Beta Setup.exe" works fine - can be founf here in "Download beta versions and old releases"
I'm having the same problem, how did you fix this?! I am using dual monitors with Brightness Controller 1.5.7 Beta Setup.exe But I see only one controller for one monitor. Any idea? Had the same and just fixed it! Try plugging the USB cables into different ports - seems to reset them. "Unable to detect any Apple Display USB HID Devices". USB cable plugged in camera and sound can use..
On a mac, apparently you can disable the bottons on the side? Any chance of that feature here? Stupid things always press themselves. Monitor used to turn on an off, now the brightness up buttons is "stuck". Kill my eyes. Hi, i have a compatibility issue with windows 10. Starting the tool it states i should install dot Net 4.5, but Win 10 has a newer version. I tried to run it with winXP or WIN7 compatibility mode, no success. Will there be a compatibility update? hi thanks a lot, the beta solves the Net 4.5 issue! Thank You, but can You somehow transfer it to OS X, Apple stop support Cinema HD (Acrylic frame), so there is no longer bridges control. Please help. Best for You. I have problems with both my 20" Cinema Displays (A1081). One is from 2005, one from 2007. Older one has its original AC converter (as far as I know) other one has original Apple converter but from older model (I had to cover its middle pins on DC plug to get it working). Both monitors are working, but Brightness Controller reports that it is unable to detect any Apple Display. USB cable is of course connected (I tried various accessible ports) and USB Hubs on the back of monitors are working. I tried them one at a time on Windows 7 (tower with DVI-D port) and 10 (laptop with HDMI>DVI-D converter), both 64-bit. I tried latest beta (1.5.7) as well as first Brightness Controller with 20" support (1.3.1). Issue is present in both. I ran both versions as Administrator. Can you please help me figure out/fix this problem? It work perfectly for me and my led cinema display 24p and windows 7. I have donate. Thank you very much for your excelent work! I get this error message on Brightness Controller 1.5.7 beta on Windows 10. "A compatible Cinema Display was detected but Brightness Controller was unable to open the USB HID Device. Please make sure any other program using the device are closed"
However no other programs are open. I even selected the option to start Brightness Controller at startup and I also tried running as Administrator but still get the same error message. I recently received an older-but-like-new 24" LED Cinema Display as a gift and have successfully connected it to my Windows 7 Pro PC using an appropriate video card and cable adapter. Unfortunately it defaults to max brightness which is unusable for me. I'd like to use Brightness Controller to fix this, but when I attempt to install it, I get an error saying I need .NET Framework 4.5. When I download and attempt to install that version, I get an error saying the same or newer version is already installed (I have 4.7), and can't go any further. Any way to make this work? I finally took time to read completely through the thread and discovered the answer to my question: install the latest beta and it won't worry about the .NET version. I did so and am very happy with the results -- up and running on a beautiful Cinema Display and Windows 7. Thank you, Jens -- I will be donating!